Ibe and his girlfriend Gladys played by Mary Uranta are at loggerheads because Gladys wants to get married as soon as possible so she nags him about not being formally introduced to his family. Emilia warns Ibe that Gladys is desperate and because of this will not make a good wife. Her words in his ears put doubts in his mind about her and soon he brings a new girl to the house. Again Emelia starts meddling. Not only does she arrange a confrontation between Ibe and his ex and current girlfriend but she starts trouble between Donald and all his family but at the same time paints herself as the good wife to all of them. Ethel played by Chrystabel Ekeh is given the code name Zebra opens the movie making a confessional to a priest. Her target is Ibe. Yvonne played by Nana Ama Ohusua is given the code name Whisper and her target is Donald. Gladys played by Mary Uranta is given the code name Cobra and her target is Ibe. Emilia is given the code name Shutter and is played by Jackie Appiah. She has been sleeping with a man pretending to be a priest. We are not told her target we can only assume it is both Donald and Ibe as she is Donald’s wife and lives with both men. We see her given instructions to “immobilise the old hag” before we see her mother in law being hit by a car. The question is why are Ibe and Donald being targeted? And why would a 419 operation last so many years to the point of marriage etc. This movie raises the question, where does one’s loyalty lie? Is it to the family you create or the family that pre-existed? Donald allows his wife to upset all his familial relationships. In my opinion it is a question of using common sense and doing what is right. None of his family have wronged him yet he allows his wife into manipulating him into believing that they are evil. Even though Donald is not the father he has unconditional love for his son. After all he raised him. 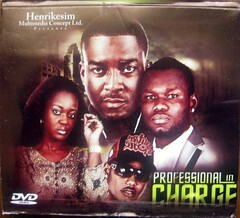 This is a first in Nollywood. Normally if there is no blood tie the child will get dashed immediately especially if the child is young. We see Donald shower him with unconditional love even after the evil treatment that was meted out to him by the boy’s biological mother and father. The whole juju theme was not necessary. It kinda ruined it for me. What was the point? From a story about professional 419ers it turned into a story about spiritual warfare! The prayer warrior stuff in part 2 went on way too long. I started getting a bit bored of it. Chidi Mokeme did a great job as Donald. His character was believable and he excelled as a man losing his mind after his wife’s manipulation. His anguish felt real and my favourite scene was where he confronts his kinsmen and grabbed one of them begging him to kill him. It was a passionate performance. 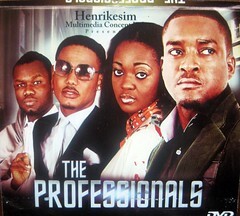 Jackie Appiah too was on her JOB, manipulative, subtly evil beneath the caring wife behaviour. It would have been so evil to overdo the evil side of her character but the way it was done was cleverly balanced out. You can imagine how such a woman could easily deceive those around her even to the point to make Ibe think that perhaps he had imagined her wicked behaviour. One minute Sharon was being called Sharon and the next minute Oluchi. Say What? Consistency is key. The poisoning scene was so fake with both of the girls clutching their stomachs at the same time. Say what? Mary Uranta is making a “guest appearance.” This is announced in the opening credits. How can a minor actress make a guest appearance? That just means you are an extra! Nonsense. Now if they said Genny that would be another story. As it turns out Mary Uranta was not just an extra so why she had to be announced as a guest appearance I didn’t get. Say What? I would recommend the movie it was an interesting storyline and was entertaining, however it could have been way better were it more concisely told and with the omission of the juju tangent. The ending sort of tied ends up but didn’t explain why Donald was targeted in the first place or the beginning scene with Nelson acting as a priest. How did that tie in with the story as a whole? How long had the operation been going on? Those questions aside the movie is worth watching, just make sure you get parts 1-4 or you will end up feeling frustrated! you do a great job with ur site. I actually come here to red reviews before watching movies, but I have decided today to participate by leaving a message. Like you said, I didn´t quite get the movie introduction and guess what I haven´t gotten yet the continuation to watch. It is so frustrating! Wish u a good day. Thank you 3MC! I would recommend getting the continuation if you can because it wraps the story up. I will try. It is just so hard in my town to get it. The only shop I used to get movies from is no more. Anyway, Im not loosing hope. be blessed! No I don't agree. I think it gives people an excuse to blame juju for anything wrong that they do. We all know that in real life a man can behave like this just because he wants to or is being manipulated or coerced. It doesn't take juju. Yes that is a NOLLYWOOD breakthrough. A man fighting for a child that is not biologically his. I was impressed, now with the whole juju nonsense not so much. It shows lack of creativity to me.